Happy Groundhog Day! Punxsutawney Phil, the Pennsylvania groundhog famous for making mid-winter weather forecasts, saw his shadow today and has predicted six more weeks of winter weather. What better way to prepare for the chilliness ahead with a cozy and warming cup of tea? Creating your own tea bags is surprisingly easy to do. Especially when you take into consideration that – more often than not – loose tea is fresher, tastier, and more cost effective than its pre-bagged counterpart. As an added bonus, drinking tea is good for you! Studies have found that some teas may help combat cancer, heart disease, and diabetes; encourage weight loss, lower cholesterol, and bring about mental alertness. And for those of you worried about caffeine – try an herbal blend. Herbal teas, also known as tisanes, are made from herbs, fruits, seeds, and/or roots, and contain no tea leaves – thus no caffeine. However you spin it, it’s a win-win sort of situation. So brew up a blend of chamomile, fennel, and ginger to help ease digestion and calm the nerves; or try a touch of rosehip and candied mango with your usual breakfast blend to spice up your morning. 2. Cut out a rectangle from the coffee filter – making sure that one of the shorter sides is placed on the fold (see diagram). 3. Stitch together the two longer sides of the rectangles so that it forms a small pouch. Fill the pouch with about 1-2 teaspoons of loose tea. 4. 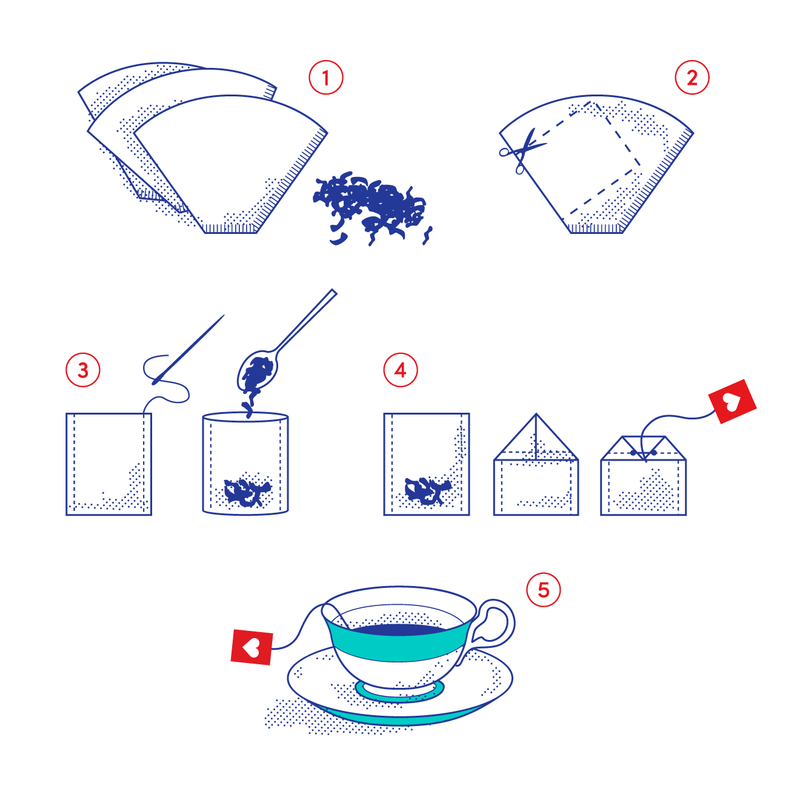 Fold over the down the corners of the pouch (as shown on the diagram), place a piece of twine in the center of the tea bag, and use a stapler to hold it shut. Use scraps of paper to create paper tags and glue them onto the end of the twine.